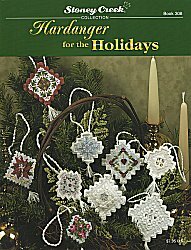 Hardanger Stitch Diagrams and Instructions are included. The ornaments pictured were stitched on 24 ct congress cloth with cross stitch worked over 2 threads. Approximate design size is 3 1/4" x 3 1/4".